Name that wild bee. Is it a sweat bee? Polyester bee? Bumblebee? 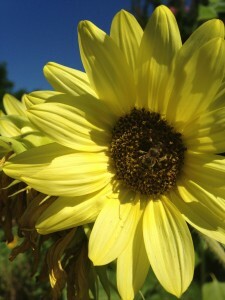 I joined the Great Sunflower Project a few years ago. It’s a virtual community of gardeners, beekeepers, and amateurs like me who sign up to track pollinator visits to their sunflowers and submit the data online. This spring, the project asked that all participants use only one cultivar of sunflower (Helianthus annuus) for the experiment: the Lemon Queen. 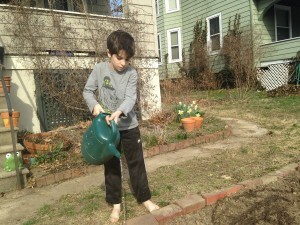 I enlisted my eight-year-old garden helper to help with the planting, and by summer we had a crop of Lemon Queens in the front yard, all facing south, bent over with their own weight. The Project website promises that the records are being converted into valuable datasets about how our pollinators are doing across the U.S. Of course, there’s a lot of selection bias in a survey like this—it’s a volunteer study, so some regions will be over-represented while others are under-represented. (If nothing else, the project will tell us which states have residents who are enthusiastic about doing a project like this.) That said, counting bees as they practically stumble away from the flower, weighed down by the pollen that they’re bringing home to babies, is a good way to pass the time. (Pollen is for babies; nectar is for drinking.) So far, the project has published state averages for reported pollinator sightings. Maryland’s hourly average is 10.3 bees per hour per sunflower. * My own counts range from about 20 to 50 bees per hour per Queen. Clearly, my garden has the good stuff. One of the things I like about this project is that it gets people to pay attention to the much-neglected populations of wild, native bees. The media reports regularly on colony collapse disorder (CCD), the troubling and mystifying decline of honeybee populations since 2006 that some have dubbed “The Beepocalypse.” Honeybees are domesticated pollinators, non-native to North America, brought here in the 1600s to pollinate our crops. For 400 years, genus Apis has been working very hard to feed us, and bee-people like to say that bees are responsible for every third bite of food. But there’s a world of pollinators beyond the domesticated honeybee. These native species include the bumblebee, genus Bombus, many kinds of sweat bees, Lasioglossum and Halictus, and thousands of other bee species, as well as butterflies and birds. Their numbers are declining right along with the honeybee population. (The monarch, in particular, is imperiled, with a 90 percent decline in the last 20 years). In February of this year a study published in Nature found that the UK’s wild bumblebee population is just as plagued as the honeybee population, and that they’re disappearing at a similar rate. And this month a story in Science argues that the decline in wild pollinators will have an especially devastating effect in resource-poor parts of the world: in those vulnerable parts, the most nutrient-rich foods depend on pollination. For now, the honeybees are getting most of the attention. I’ll keep my eyes on the neglected natives and plant milkweed and Lemon Queens and whatever else the wild ones might like. 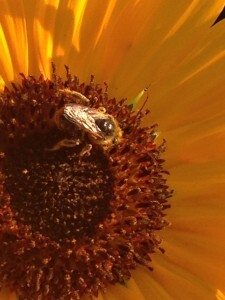 At the Great Sunflower Project, they sign their emails “Bee well.” Let’s hope so. *The Great Sunflower Project also has maps showing the use of four types of neonicitinoids across the U.S., and it links to the USGS maps that track the use of about 500 pesticides. The Project still doesn’t have enough data to draw conclusions about the effects of all the different neonicitonoids, but they say they’re picking up the signal of pesticide use and can show that the bees per hour in backyards that are near areas where there is a lot of spraying of neonictinoid pesticides are much lower than areas where there is little neonictinoid use. **Theories about the cause of CCD abound. Possible causes include pesticides, parasites and disease (including tracheal mites, foulbrood bacterial infection, Nosema fungus, Israel Acute Paralysis Virus, and Varroa mites), and loss of habitat (prairies and wetlands). Some say the cause is stress—from environmental changes, from malnutrition, or from genetically modified organisms that they feed on. Others suggest that the culprit is a dastardly practice of feeding honeybees high fructose corn syrup instead of their own honey. And then there’s this latest harsh winter, here in the U.S. and in the UK, that may have killed off one-third of the honeybee population in Scotland and even more in the Midwest. As people started to worry more about CCD, “Beepocalypse” became a more commonplace term. Concerns about food supply, especially almonds, and food prices have been increasing over several years. Estimates about expected losses to important crops make the news regularly. Two years ago, this website, “Rapture is Imminent,” included CCD as a contributor to the end times, which the site says are nigh, and declared pesticides the cause. End-timers are hardly the only ones focusing on pesticides as the cause. The class of pesticides getting the most attention is the neonicotinoids, which have been banned in the EU in an attempt to halt CCD. This Bloomberg News story from May 2014 addresses the role of neonicotinoids on colony collapse disorder. While there’s still no absolute proof, it seems likely that pesticides have some role as the final straw as honeybees do battle against mites, foulbrood bacterial infection, fungi and. In the EU, where the use of neonicitinoids has been banned, there’s backlash. Here’s an interesting story from The Guardian about one of the effects of the EU ban: farmers of rapeseed are saying that their plants have been plagued with flea beetles, and some farmers report a 30 percent decline in harvest.